Cole Winslow, a senior at Greater Houlton Christian Academy, has been selected to receive the 2019 Principal’s Award. 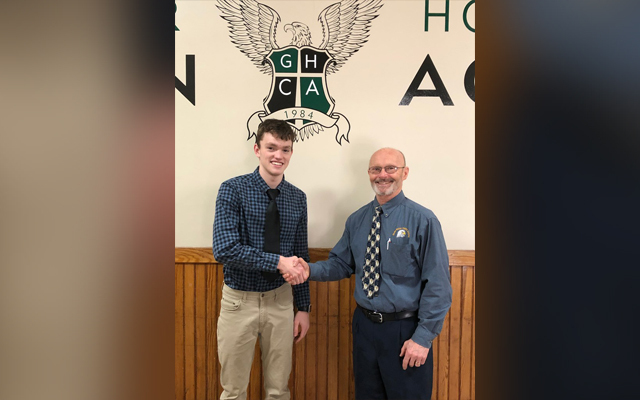 HOULTON, Maine — Cole Winslow, a senior at Greater Houlton Christian Academy, has been selected to receive the 2019 Principal’s Award. The award, sponsored by the Maine Principals’ Association, is given in recognition of a high school senior’s academic achievement and citizenship. Cole, Mr. Zimmerman, Head of School, and other award winners and their principals will attend an Honors Luncheon at Jeff’s Catering in Brewer on Saturday, April 6, 2019 at 12:30 pm. The Honors Luncheon recognizes these outstanding students with the presentation of an individual plaque and the awarding of five $1000.00 scholarships in the names of Horace O. McGowan and Richard W. Tyler. Mr. McGowan and Mr. Tyler were former Maine principals and executive directors of the Association. An additional five $1000.00 scholarships will be presented through the efforts of the MPA Scholarship Golf Tournament.